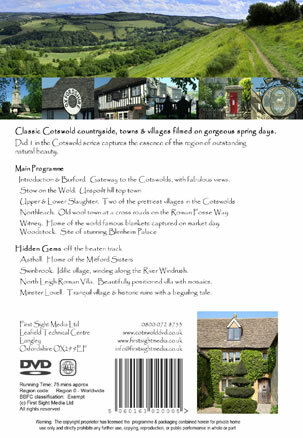 Welcome to our DVD, The Cotswolds A Visitors Guide. If you are a visitor planning to tour the region looking to research it for places of interest beforehand or you are already in the area looking for a memento of places you have discovered to show your friends and family our DVDs will be perfect. 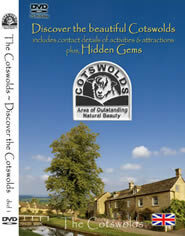 The Cotswolds A Visitors Guide showcases classic Cotswold countryside, towns and villages filmed on gorgeous spring days. The main program begins in Burford, a beautiful town spanning the river Windrush; a Cotswolds town very popular with visitors. 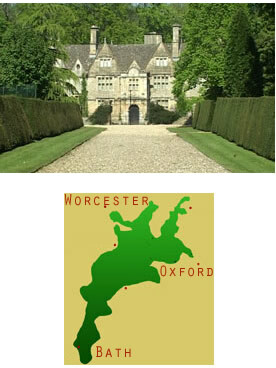 The Oxfordshire country surrounding it is often referred to as the Gateway to the Cotswolds. It was famous for its wool trade in the early 14thcentury.The town became very wealthy and many beautiful golden stone houses were built .The DVD Cotswolds- a Visitors guide explores this town in depth reliving its history while focusing too on the many pubs, restaurants, tea rooms and dress shops. It shows us how to enjoy the modern while appreciating the old. Stow-on-the-Wold is then featured in this unique DVD. Founded in the 11th century this town is picturesque with some of the best Cotswolds towns and restaurants there. The Royalist Hotel and The King Arms are two of the oldest inns in England. It is well known for its many antique shops and the Toy museum is internationally renowned. Stow-on-the-wold is the highest town in the Cotswolds and a place not to be missed. The Cotswolds A Visitors guide then winds its way to Upper and Lower Slaughter. They are both such scenic tranquil villages and the visitor is urged to wander through these two villages. Lords of the Manor Hotel in Upper Slaughter is well known and a delightful place to stay. Lower Slaughter is very scenic and famous for its church St. Marys and the Cotswolds stone bridges. Absorb the atmosphere and beauty of these two villages in The Cotswolds-a Visitors guide. Northleach is a market town bustling with lively activity. The town centre has not changed since 1500 but offers a wealth of shopping facilities. The history and the beautiful churches of Northleach in the Cotswolds are explored in the DVD. Witney is famous for its high quality blankets and the famous Teddy Bear shop. The Teddy Bear shop is open seven days a week and is well known for its limited edition of Teddys. Witney is portrayed as a very tranquil village. Woodstock is explored and the quaint shops, inns and private houses will delight you. It is famous for its Royal connections. Blenheim Palace in Woodstock, Cotswolds was also the birthplace of Winston Churchhill. The next section of the Cotswolds-a Visitors guide features “HIDDEN GEMS” off the beaten track and the villages of Asthall, Swinbrook, North Leigh Roman Villa and Minstell Lovell will capture and enchant you. 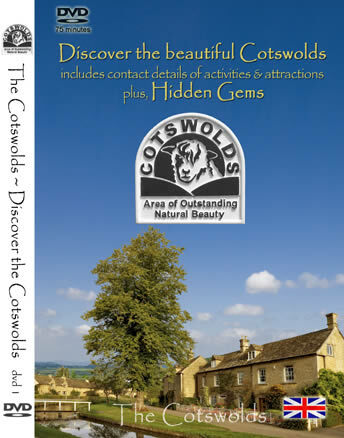 We aim to make your tour around the region as enjoyable as possible and have added a list of activities and attractions near each place we feature in the Cotswolds DVD. Please do not hesitate to contact us if you have any comments about the DVD or have any suggestions for future programs. We hope you enjoy your visit to this area of outstanding natural beauty.